You can now set your service area in Google My Business as a region, city, or ZIP code. No longer are Service Area Businesses required to provide a physical business address in Google My Business. Consumers searching for Service Area Businesses are most likely to click on organic links to directory listings. Clicks on Service Area Businesses in the Local Pack are heavily motivated by review scores and totals. Big news for Service Area Businesses (SABs) this week, as Google has confirmed and rolled out a change to the way you set your service area in Google My Business (GMB). Whereas previously you could define the radius around your business address (e.g. ‘Serving customers within 40 miles’) in GMB, you now have to define your service area by region, city, or ZIP code instead. As this is no longer tied to your business address, you now have the option to not display this in your GMB if you don’t serve customers at your business address. This will be a welcome relief for SABs having to turn customers away from their front doors! SABs will now be able to create a listing without designating an address (verification may still be required in most instances). Existing SAB’s will be able to remove their address. Removing your address and not designating a Service Area will default to the country. If postcard verification is needed, the address will not show on maps. The core reason for this is to better match the consumer to SAB’s. If you designate multiple service areas, Google will rank them equally. It will be particularly interesting to see how much this affects how Google’s Local Services Ads (LSAs), which appear at the very top of SERPs for searches for service areas businesses in certain parts of the USA. Where Do People Click on SERPs for Service Area Businesses? 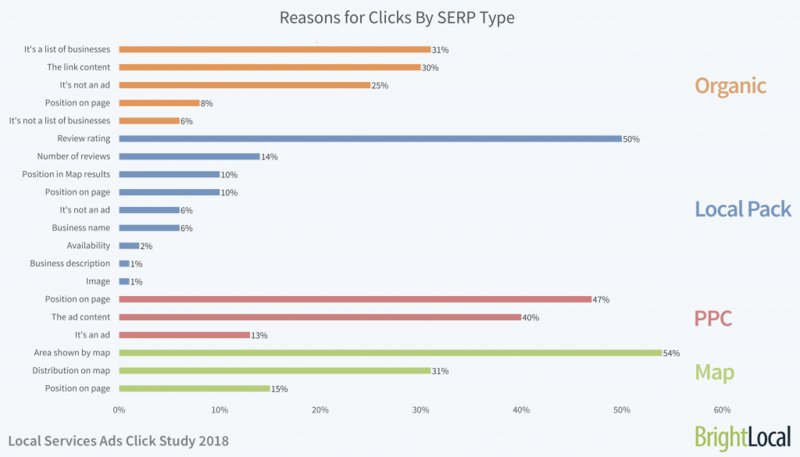 On that note, as part of our recent study into the impact of LSAs on SERP clicks, we broke down where and why users click on particular SERP links when searching for a SAB. Even though the study was ostensibly about LSAs, we noticed some really interesting trends on clicks on standard SAB SERPs (for searches like ‘plumbers san francisco’). As you can see, more than 50% of all clicks on SAB SERPs (without LSAs present) go to organic search results, and an impressive 32.26% go to the Local Pack. Although PPC ads appearing at the top of the page receive a credible amount of clicks (14.11%), the same can’t be said for PPC ads at the bottom of the page, which receive a paltry 0.44%. That’s the ‘what’ covered; now it’s time to look at the ‘why’, which reveals some really interesting motivations behind clicks that can help your refine your local SEO strategy. Why Do Consumers Click Where They Do on SERPs for Service Area Businesses? This data reveals a few key things that should help anyone working with a Service Area Business to focus on areas that will really make a difference to clickthroughs. Firstly, nearly a third of people who clicked on an organic result did so because they knew it was a link to a directory. Although these links tended to appear the highest in organic rankings, you’ll notice that only 8% of people clicked an organic link because of its position on the page. This strongly suggests that those in the local SAB research phase are highly likely to be looking for a list of the ‘best’ or ‘top’ businesses, rather than refining their search based on what appears in the SERP. We’ve researched and written extensively on online reviews, so if you need a business case to get serious about reviews, the following studies should help reinforce it. If you’re looking for help generating, monitoring and responding to reviews, guess what, we’ve got that covered, too! Check out our recently launched tool, Reputation Manager. 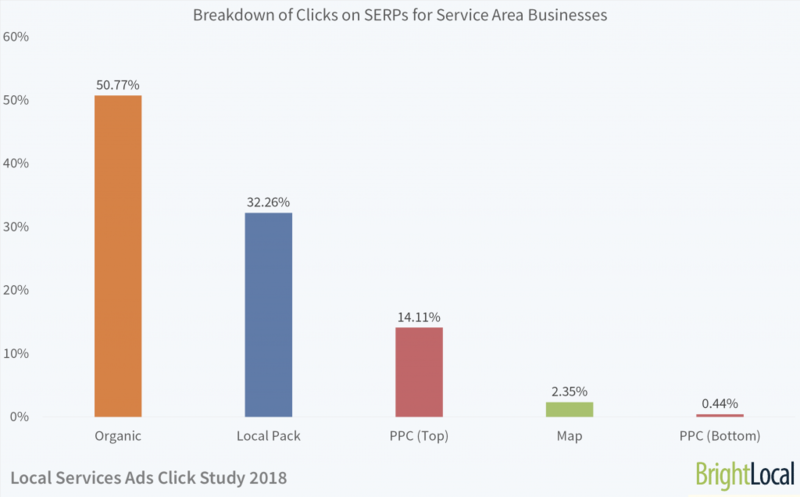 If you’re working with Service Area Businesses in the US and haven’t already taken a look, I’d strongly recommend you check out the recent Local Services Ads Study. With expert commentary, you’ll come away with a full understanding of what goes on in SERPs when someone searches for an SAB. How do you feel about the update to Service Area in GMB? Is it a positive or negative change? And what do you take away from these findings about SERPs? Let us know in the comments below.